Herring are small oily fish found in the North Atlantic, North Pacific, Baltic Sea, and Mediterranean. 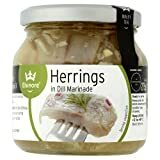 They have been eaten since atleast 3000 BCE, are rich in Omega-3 fatty acids, and a source of vitamin D.
Herring can be prepared a number of different ways, including being eaten raw, fermented or pickled. Pickled herring is a popular food in Scandinavian cuisine and Jewish cuisine. Rollmops are pickled herring fillets with gherkin and onion. Kippers are half a smoked herring. They are popular in British cuisine, especially as a traditional breakfast dish. Sild are immature herring in cans. Whitebait are small herring eaten whole, mostly commonly battered and then fried. (The word whitebait is also used sometimes used in some countries to refer to other small fish). Polar’s Kipper and Herring are produced in a new state-of-the art “Green” cannery located in Germany. The Herring used in Polar products originate from the cold Northeast Atlantic Norwegian Sea region. The fish caught in these waters are known for high Omega 3 Fatty Acids. Polar’s Kipper Snack is naturally smoked using a variety of beach wood shavings and contains NO chemical dyes or imitation smoke flavor. It is also hand packed to ensure the delicate texture of the fillet. 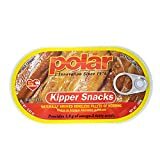 Polar's Kipper snack has a natural smoked taste you will love. When you live on the coast of Maine, your life is ruled by water. Waves, gulls in the sky, the thrilling tug of a fish on the line. Bar Harbor's herring, mackerel, and kippers keep the clean bite of cold, clear water in mind. All Bar Harbor seafood has the snap of crisp offshore wind, and is made by people who grew up on the water. It's as close to "fresh off the boat" as you can get without being there. BRUNSWICK Boneless Herring Fillet Kippered Seafood Snacks contain boneless herring fillets with a lighter smoke flavor—a traditional favorite. At BUMBLE BEE Seafoods, practicing sustainability is an organizational imperative. As a seafood company, no single aspect is more important, or more central to, BUMBLE BEE Foods’ sustainability program than ensuring the responsible harvesting and management of seafood we provide to our consumers. BUMBLE BEE Seafoods was founded in 1899 by a handful of dedicated fishermen. Today, privately held and headquartered in the United States, BUMBLE BEE Seafoods is North America’s largest branded shelf-stable seafood company, offering a full line of canned and pouched tuna, salmon, sardines, and specialty seafood products marketed in the U.S. under leading brands including BUMBLE BEE, BRUNSWICK, SWEET SUE, SNOW'S, BEACH CLIFF, WILD SELECTIONS, BUMBLE BEE SUPERFRESH, and in Canada under the CLOVER LEAF brand. The BUMBLE BEE brand has established significant consumer awareness and loyalty based on the quality, nutritional value, and affordability of its products. Delicious Smoked Herring Fillets in Vegetable Oil and Own Juice. Approximately 15 grams of protein per serving. Polar's Kipper and Herring are produced in a new state-of-the art Green cannery located in Germany. The Herring used in Polar products originate from the cold Northeast Atlantic Norwegian Sea region. The fish caught in these waters are known for high Omega 3 Fatty Acids. Polar's Kipper Snack is naturally smoked using a variety of beach wood shavings and contains NO chemical dyes or imitation smoke flavor. It is also hand packed to ensure the delicate texture of the fillet. 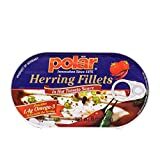 Polar's Herring in Sauce are also hand packed and filled with a traditional savory sauce to complete any meal. Bar Harbor Foods sits on a picturesque wharf on a beautiful sheltered cove in Downeast Maine. The cries of gulls echo across the water; the tide laps against pilings as the tie lines of the fishing boats stretch and creak in the sun and fog. This is where we make our premium specialty seafood – fresh off the docks of Maine. While the business has expanded and changed over the past 85 years, Downeast Maine still inspires all our products. Our premium foods reflect naturally delicious New England cuisine and authentic Maine traditions. We like to keep things simple, from original recipes and fresh natural ingredients, to the appealing simplicity of our labels. Our specialty seafood and other fine foods are made in small batches and packed and canned mostly by hand, just like people on the coast of Maine have been doing for generations. Bar Harbor is a special place – you can taste it! Our fish is sourced from the cold north sea of Norway where the fish is of the highest fat content, meaning better taste and quality. Our herring filet average 13.7 inches (before cleaning of head and tail). Our fish is hand processed using the latest technology and constantly monitored by a laboratory. Free glucose, MSG (monosodium glutamate) and nitrates. RügenFisch Herring Fillets in Wine Sauce, Certified Sustainable SeaFood, MSC certified. Herrings in Dill Marinade Ready to Serve Rich in Omega 3 Marine Stewardship Council - Certified Sustainable Seafood, MSC, C-BV-1-8D35ZE-DK, From an MSC certified sustainable fishery, www.msc.org, Norway spring spawning herring.